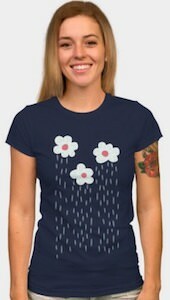 Now there is a flowery rain clouds t-shirt that makes you see what the clouds really look like. We all looked at clouds and thought they look like something and now there is a t-shirt that has three rainclouds on it that look like flowers and how do you know that they are rain clouds you wonder, simple there is rain falling out of the clouds. You can get this women’s t-shirt in many colors and styles so that you can wear a friendly rain cloud t-shirt every day of the week. On this t-shirt it is all about being outside in the rain. 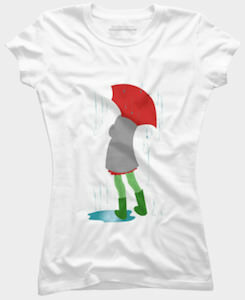 On the t-shirt you can see a girl standing in a puddle with her rain boots and she is also holding up a red umbrella that seems to keep her dry from the falling rain. The picture on the t-shirt is fun specially because it has so much color while not showing that much detail leaving more for people the guess. This rainy day t-shirt comes in men and women’s styles in many sizes and colors so that you can wear the rain t-shirt you like to wear on a day that may be even sunny and warm. 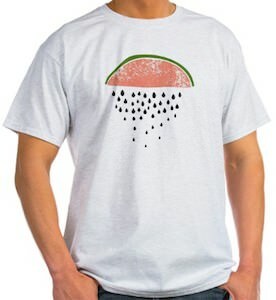 This t-shirt shows a piece of watermelon hanging upside-down and that makes the pits fall out and that means it looks like it’s raining. A fun t-shirt like this of course comes in different colors, styles and sizes. And the fun design of the shirt makes you hungry for summer so that you can take a bite out of a piece of watermelon. But the t-shirt also reminds me of rain and rainbows but hey that could just be me. We all needs are fruit and veggies so maybe wearing a t-shirt like this counts. Lets make it rain by wearing this Watermelon Rain T-Shirt. There are days that we don’t mind a little bit of rain but there are many many others that you prefer the sun. And to make sure you get some sunny day’s you have to get a t-shirt like this. This t-shirt that comes in all kind of styles, colors and sizes from men, women and children. 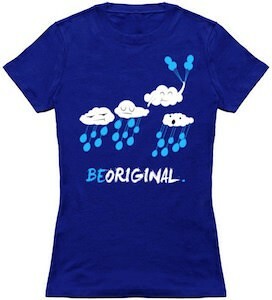 And on the t-shirt you can see a rain cloud with rain dripping out of it. Above the cloud it says “Rain, Rain, Go Away!” and that of course will make sure that your day outside will be nice and sunny so that you can do you planned activity without the worry of rain. 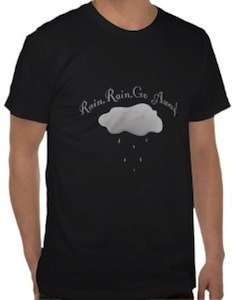 Help the weather person by wearing this Rain Rain Go Away T-Shirt. The girls are gone love this fun Hello Kitty T-shirt. 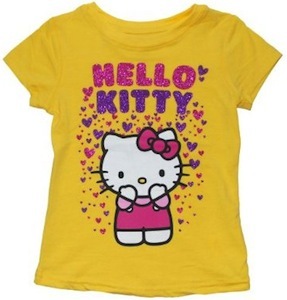 This yellow t-shirt who’s Hello Kitty surrounded by hearts it is raining hearts that all look glittery and pretty. You can get this t-shirt in sizes 2t, 3t and 4t . If you like Hello Kitty then you will love this girly raining hearts t-shirt. Don’t wait just come and order this Hello Kitty Raining Hearts T-Shirt. The Weather girl always makes you happy when she predicts sun, but this girl has other plans. A sweet shirt that comes in different styles and colors but all show this cool image. 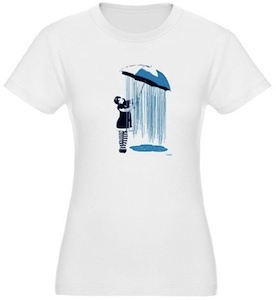 The shirt shows a girl with an umbrella but this umbrella doesn’t seem to work right. This umbrella has it raining under it and there is no rain any where else in the picture. A great design that will keep interest you for a long time. Just a must have t-shirt rain or shine. Go get your own Weather Girl T-Shirt.